Paul McNeil and Hamish Muir are on a mission. 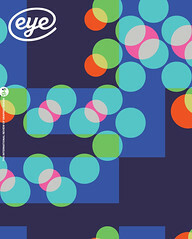 They are designers who – as MuirMcNeil – make typefaces that work in mysterious but mathematical ways. Using methods that are entirely contemporary, though they can seem arcane, they explore ‘parametric design systems’. And there is something about their commitment to a punchy, practical, systems-based approach that communicates far and wide. Though they eschew ‘style’, their fonts and posters – including identities for the London College of Communication (LCC) and TypeCon – are recognisable within seconds. They also have robust theories about the experimental, almost scientific methods they apply to design and design education. One might be tempted to describe these two articulate and opinionated designers as ‘bursting with ideas’, except for their highly public rejection of ‘ideas’ as unnecessary and problematic – for emerging designers and students in particular. Silk-screened poster (2010) for the Interact type system using the colours PMS 926 and 809, in of an edition of 100 printed on 160gsm Naturalis Absolute Smooth. Dimensions: 100×70cm. 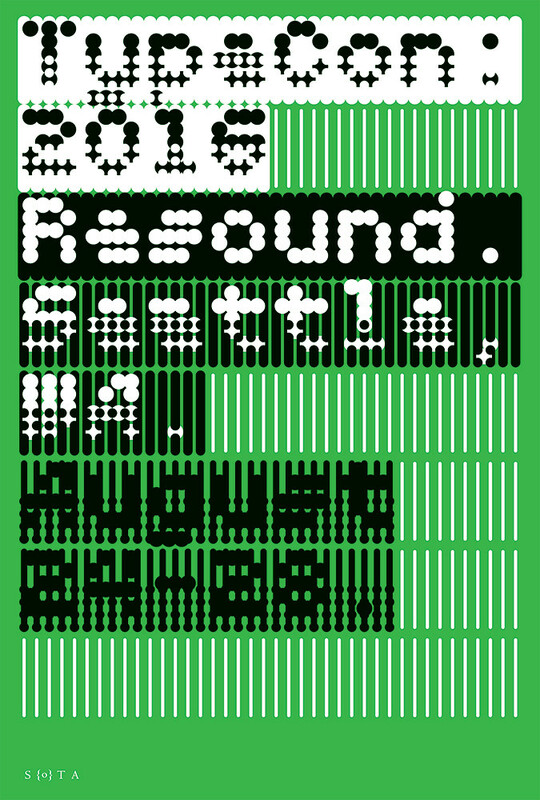 Top: MuirMcNeil’s identity design for TypeCon, the annual convention of the Society of Typographic Aficionados (Sota) held in Seattle in the United States, 24-28 August 2016. However Muir are McNeil are not content to leave their work in a typographic Petri dish. Aesthetic judgement, plus their sense of what works, quickly enters their mode of production. Their typefaces have a robustness that belies their experimental origins. Muir frequently (indeed notoriously) disdains suggestions that design is ‘creative’ or ‘about ideas’ – what he calls the ‘look at clever little me’ stuff. He worries that such notions seriously inhibit young designers. MuirMcNeil’s work has always sought to be about content and context, through discovery more than preconception. Muir likes to quote the late Ian Noble’s notion of ‘standing still and digging deep’. The pair’s embrace of process and systems echoes many forms of culture, including the Systems Group of the 1960s; artists and designers such as Frieder Nake, Hansjörg Mayer and Paul Brown; composers such as Steve Reich and Michael Nyman; and film-makers Peter Greenaway and Godfrey Reggio. They cite the long history of what they call ‘constructed’ typefaces, whose appearance is determined by the technologies used to make them. Their long list of examples spans five centuries, including the Romain du Roi, the Plaque Découpée Universelle, commercial stencil types and DIN 1451, plus alphabets by Renner, Bayer, Albers, Koch, Cassandre, Frutiger, Knuth, Norm and Lineto. As rebellious ‘outsiders’ go, McNeil and Muir are remarkably well accepted and acclaimed by the design establishment. Both men combine design practice with teaching, and they are long-standing members of prestigious design organisations – Muir in Alliance Graphique Internationale (AGI) and McNeil in the International Society of Typographic Designers (ISTD). Muir is well known as a founder of UK practice 8vo (1985-2001) and their legendary, eight-issue design magazine Octavo (see Eye 9), which Unit Editions is publishing as a big, Kickstarter-funded book later this year. Yet they proudly relish their ‘outsider’ status, a sense that the way they work – through experimental processes closer to chemistry and biology – goes against the grain of current design fashions and obsessions. They make typefaces first of all for themselves, and then for other graphic designers; their work has a small but substantial fan base. Despite their enthusiastic immersion in the pleasures of process, deep down they understand that a typeface has little value until it is used. And they strive to make typeface families that work. Some of the letterforms in which they find inspiration – such as those devised by Wim Crouwel for his Stedelijk museum posters – were made in very limited character sets, sometimes no more than the handful of letters needed for each poster’s text. MuirMcNeil, however, habitually take on the responsibility of creating a full ‘Latin 1’ standard character set, including ligatures. The lighter, simpler weights of ThreeSix, for example, are reassuringly legible as 10pt text printed on newsprint in U:R/D 03, the Unit Editions tabloid about the project, and there is enough craft and care in the multiple iterations of the typeface to meet the needs of designers with very different agendas. 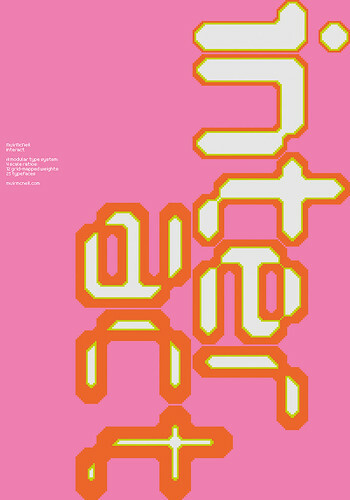 Griffiths has used MuirMcNeil’s typefaces in magazine covers for Desktop (Australia) and Brain (Japan), and in posters for her workshop series ‘typ gr ph c’ and contemporary dance by Oliver Connew. When Griffiths took part in ‘The Alphabet’, a 26-day art project with the US regional newspaper Sentinel & Enterprise (in Fitchburg, MA) in which 26 different typographers set a different front page character each day, she used TwoPoint for her letter ‘U’. Griffiths’ dazzling ‘Collidescape’ (2015-17), a seven-metre high grid of glazed panels at the entrance of Te Kei, the new building designed by Athfield Architects at the Ara Institute of Canterbury in Christchurch, New Zealand, makes use of TwoPoint and Panopticon. Pentagram’s Eddie Opara specified ThreeSix in his identity design for Makr Shakr, the ‘robotic cocktail bar’ made for the Google I/O conference in 2015, playing on the typeface’s associations with ‘retro futurism’ for this jokey installation / experiment. Designer and teacher Nick Kapica used ThreeSix for the concrete entrance panel for a university building in New Zealand. Kapica has known Muir and admired his work since the former was a student nearly three decades ago, and had seen the typeface in its early research phase in 2008. He also used ThreeSix for the limited edition ‘1974 Clock’ (2011, with product designer Chris Jackson) and Panopticon for the 2015 ‘A L’Arme!’ music festival in Berlin. Both McNeil and Muir are old enough to remember a time when graphic design practice required the careful drawing and specification of artwork for printing, the struggle of trying to control a Rotring pen, compasses or a scalpel blade. Yet they are young enough to have been involved in the first flush of digital culture. They experienced the computer’s impact upon the design industry in the late 1980s, 90s and 2000s; Muir’s work with Octavo has had a profound influence on more than one generation of graphic designers. And though they sometimes claim that their constructed typefaces could have been worked out on graph paper, the multiple variations they explore benefit from the iterative power of computer software, while their use of the computer is informed by their earlier experiences in artworking. However, because the designers vividly remember how things used to be, the older, more time-consuming, physical processes are still embedded in the way they work and think. McNeil talks about the ‘resistance of media’ as something that channels and gives conditions for the production of work. ‘The computer is very lacking in any resistance,’ he says, ‘it’s a fluid environment.’ They replicate their knowledge of constraints from earlier modes of production. Muir cites the ‘snap to grid’ software option as a way ‘you can push the computer’ to work the way they think. Now they have made the ‘bricks’ (in Muir’s word), the interesting part is constructing the building. Both McNeil and Muir take pride in the unfeasibly large quantity of printed material they have produced to display their typefaces – whether for clients or for themselves. The unselfconscious ease with which their work straddles the digital and the physical reaches its apotheosis in their exquisitely screenprinted posters. Their plan chests are bursting with such specimens, often using foils and special colours, such as neons; they both love the sensual pleasures of print, the deep blacks made possible by the screenprint process. Given the vast number of options available to them with any weight of any typeface, one might wonder how they ever agree what makes an acceptable final print. They explain that this is a time-consuming process, but one that they greatly enjoy.